Africa’s finest comedian Bright Okpocha famous on stage as Basket Mouth was heard telling friends in Kigali hangouts that the love he has for Rwandese made him come early. The famous rib cracker is the main headliner at annual comedy festival dubbed Seka Fest and he is scheduled to perform on March 31st – this Sunday at Gikondo Expo grounds but surprisingly he came earlier just to have some good time in the country of a Thousand Hills. Basket Mouth touched down at Kanombe International Airport last evening and despite of the long journey, the comedian couldn’t rest but straight away he stormed most of Kigali hangouts all night. Speaking to KT Press, the SekaFest organizer and comedian Arthur Nkusi who was driving around with Basket Mouth confirmed that his guest loves how Rwanda warmly welcomes him. “Basket Mouth came early with a big entourage because he feels Rwanda is the best place to chill, make friends and hangout as well as getting ready for his first ever show in Rwanda,” says Arthur Nkusi. 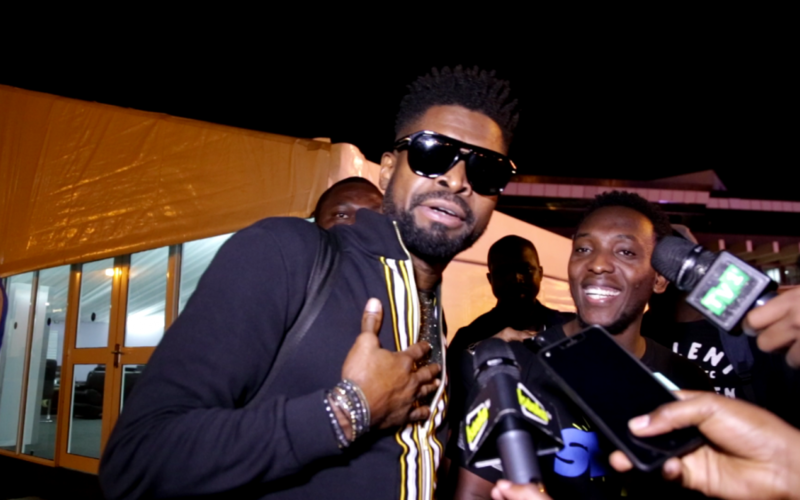 Comedian Basket Mouth and friends parted all night with the locals like nobody is watching and moved in over three clubs until morning, the smiles on their face could tell it all that they were having a good time in Rwanda. It is the first time for Basket Mouth to perform in Rwanda live but it’s not the first time for him partying in Kigali because last year straight from Africa Laughs, a show that he performed in Nairobi, he came down to Kigali to party. Meanwhile, Seka Festival this year will be graced by various renowned comedians like Kenya’s Eric Omondi, Alex Muhangi, Teacher Mpamire, and Salvador as well as Basket Mouth, all comedian will be promoting their own brands under Seka festival.